Red Lodge Kart Circuit is huge fun to drive and well positioned for those looking for something different in this neck of the woods. 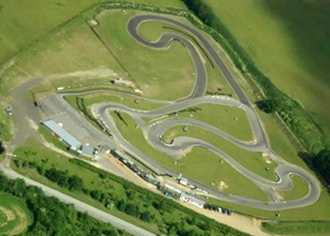 It is set in 10 acres of parkland and has been designed to be fast and exciting yet safe for the GX270 karts. There are various types of race formats that can be booked, from sprints endurance races or birthday parties for juniors. The circuit also holds owner-driver testing days and has a monthly race series 2-stroke club called 'club2000'. The on-site cafe is open every weekend club, owner-driver days and minimoto evenings. The new corporate building is also a great meeting place and an ideal facility for company events. From junction 38 off the A14 take the A11 northbound and leave this road at the first junction. At the end of the slip road turn right then left at the roundabout into the B1085 Turnpike Road. Red Lodge will be on your right. A complete range of birthday events for juniors aged 7 years an above. Medals are presented for fastest lap time. Min height 119cm for age 7 and 147cm for 12 years and above - please contact us for details.